Check out this Forehead Digital Thermometer, Non-Contact Infrared, Instant Reading, Multi-Functional on sale for $17.99 (Retail $70). -MULTI-FUNCTIONAL: Measures not only the temperature of human body(forehead) but also the surface of object, such as, milk, food, refrigerator or anything else in your house. -NON-CONTACT: The temperature can be detected within 5cm (2 inch) measurement distance,more healthy and convenient; never worry about disturbing an sleeping baby. 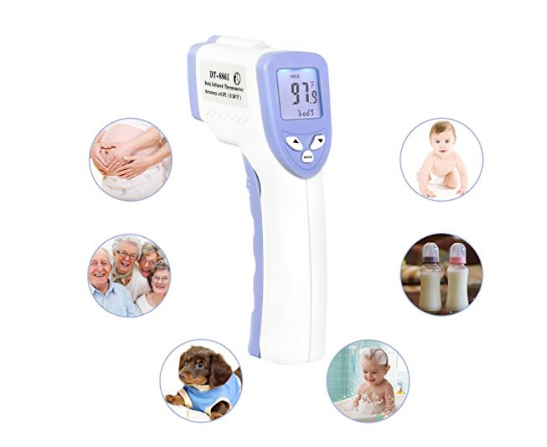 -FAST AND ACCURATE: 0.5 seconds measuring time and the accuracy is ± 0.2℃ (0.4℉); Taking temperature is never again an annoyed thing with a fussy child.